The owners of Stone Ridge cc from 2007 to 2012 was La Jolla Development Co. On 10/12/2012, Michael Schlesinger filed incorporation papers for No Stone Unturned, LLC, which purchased the $6.5 million note owed by the country club. On 4-17-2013, the bankrupt club failed to receive any bids at auction that would match the No Stone Unturned bid, so the property became his. On 6-23-15 he listed the club “for sale”. At the time, City officials said the property was not zoned for houses and that a zoning change would have to be approved by voters under Proposition FF. The San Diego Union Tribune reports that the property remained “closed”. Schlesinger has not been allowed to develop. The City of Poway is reluctant to accept the course as their research suggested the prospect of financial is not good. 11-22-2016, The San Diego Union Tribune reports that an agreement has been reached between the country club and a group of homeowners to improve the golf course and build on no more than 12% (15 acres) of the land. Cal Atlantic is the interested builder. 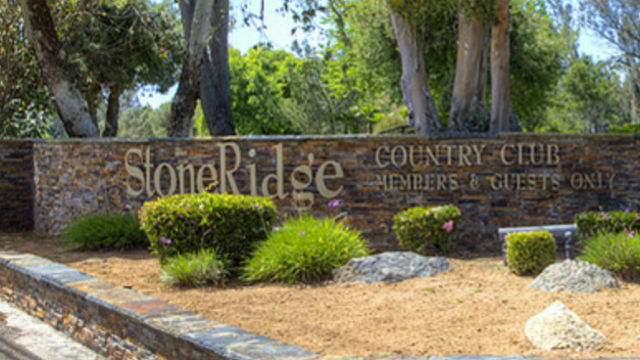 11-8-2017, StoneRidge cc was closed hours after Poway voters overwhelmingly rejected a ballot initiative that would have rezoned part of the 117 acre property to allow construction of up to 180 condominiums. The measure failed by a margin of 62% to 38%. The city-wide vote was needed to rezone the property because of a slow-growth law enacted in Poway in 1988. Mr. Schlesinger financed the signature gathering and paid the city the cost of the special election. 6-20-2018, long-time Poway resident, Kevin McNamara and Mr Schlesinger signed an agreement giving McNamara an option to buy the 117 acre property. Under the agreement, McNamara has six months to present a complete project proposal to City ,Hall. See www.gvca.info/stoneridge/ for details on the public input process and McNamara’s vision for the property.